← The 7 Habits of Highly Defective Black-Friday Shoppers. I’m all in for Buy Nothing Day. Except maybe liquor. Probably. Well, definitely. I bought a chai. But I live in Canada so I wasn’t thankful yesterday. And I was on my way to work. After having done a radio interview on the worst toys of the year. I’m only a partial hypocrite. I’m taking it one step further. I haven’t even gotten dressed. No shopping here, for sure. Guess what wound up being bloodier today? Michael’s craft store or a hike with a pit bull? P.S. – You maaaay want to see what I went out to buy at 7am this morning before you judge me. I failed at buying nothing. I bought cat food. And concert tickets. Unfortunately Canada is having the first year of ‘Black Friday’ sales to keep shoppers from crossing the border. What a crappy way to celebrate ANYTHING. Good stuff. I usually prefer to stay home and drink myself. Cheer! My son wanted Nike sweatpants at Kohl’s. I glared at him until he left. He seemed scared. Mission accomplished. Yay! Right? Do we make any sense at all? i love this. Well, I did buy myself a new cellphone today, but I also dropped a bunch of stuff off at Goodwill, so I think I’m even. Holidays are triggers for me as a person living with bipolar disorder. Finally, after so many years of setting myself up, I unplugged this year. No shopping. No family obligations or parties. It will take time to get used to this normal-ness. So true! 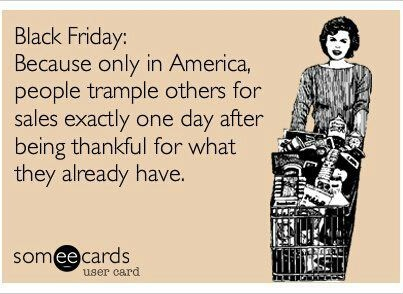 I hate Black Friday with a fiery passion that burns deep in my soul. I work in retail, so it only adds to the fury. Luckily this year I was off and happily bought nothing!